The genus Cirsium was named by Philip Miller (1691-1771). "Cirsium" is Greek for "dilated vein", a name given because of the bygone belief that a Thistle distillate opens clogged veins. Cirsium neomexicanum, Cirsium trayci, and Cirsium undulatum are difficult to separate and various floras disagree about the characteristics that distinguish the species, about where the species exist, and even about which are distinct species. Weber indicates that C. neomexicanum has white or very pale purple flower and the other two species have purple flowers. 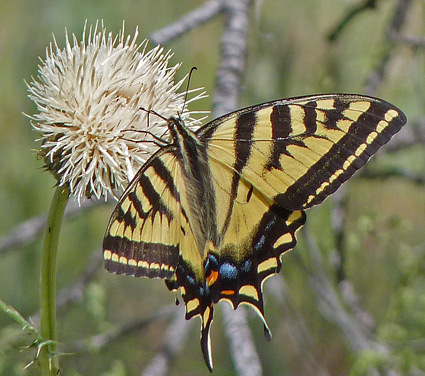 The New Mexico Thistle Identification Guide indicates that, at least in New Mexico, C. Neomexicanum "has [a] corolla usually pink, sometimes lavender or white". Other floras indicate that all three can be shades of white, pink, and purple. There is, however, general agreement in these other floras about how to separate C. neomexicanum from C. trayci and C. undulatum: The phyllaries of C. neomexicanum are spreading to reflexed (several floras indicate "strongly reflexed"). Both the spines and the tips of the phyllaries are spreading to reflexed. For C. undulatum and C. trayci just the spine may be spread outward or even reflexed some; the phyllary itself is just appressed. "Cirsium trayci is obviously allied to C. undulatum, and the distinction is sometimes difficult to draw...."
The numerous characteristics given for C. trayci and C. undulatum by the Flora of North America are almost identical , but the FNA and almost all other floras do agree, as indicated below, that the involucre of C. trayci is shorter than the involucre of C. undulatum. Unfortunately even that characteristic is not universally applicable according to the FNA: "Large-headed plants of Cirsium tracyi and small-headed individuals of C. undulatum are sometimes difficult to distinguish". Another layer of complexity is added by Stanley Welsh, A Utah Flora. He does not recognize C. tracyi at species level; instead he considers it a variety of C. undulatum. Further distinctions in the two species vary among the 6 floras I consulted, but on almost every characteristic mentioned below by one flora, another flora modifies the characteristic, does not mention it, or contradicts it. Weber: C. undulatum heads shallowly indented at the base; phyllaries narrow in 5 or more rows. C. trayci heads not indented at the base; phyllaries ovate in 3-4 rows. Ackerfield agrees with Weber and both indicate that in Colorado C. trayci is a West Slope species and C. undulatum is an East Slope species. Kartesz agrees that herbaria records indicate that C. trayci is a West Slope in Colorado species, but he indicates that there are herbaria records for C. undulatum in almost every West Slope county. Heil and O'Kane (Flora of the Four Corners Region): C. undulatum free anther tips (above the tube) longer than 1 mm; corolla lobes longer than 8 mm. C. trayci anther tips (above the tube) less than 1 mm; corolla lobes shorter than 8 mm. Flora of North America: C. undulatum Phyllaries in 8–12 rows, ovate to lanceolate (outer) to linear-lanceolate (inner); corolla lobes 6.5–13 mm. C. trayci Phyllaries in 6–10 rows, ovate to lanceolate (outer) to linear-lanceolate (inner); corolla lobes 5.5–9.5 mm. Allred (Flora Neomexicana III) adds some very helpful information to the FNA details: C. undulatum corolla lobes average 10 mm; C. trayci corolla lobes average 7 mm. In sum: C. neomexicanum can quickly be distinguished from C. trayci and C. undulatum by observing whether the phyllaries and their spines are reflexed. The best characteristics for distinguishing C. trayci from C. undulatum seem to be the height of the involucre and the length of the corolla lobes. Foothills, montane. Woodlands, openings. Spring. Near Yellow Jacket Canyon, Canyons of the Ancients National Monument, June 12, 2005. Cirsium tracyi is a common native Thistle, found especially in low, semi-desert, dry, open areas of the Four Corners region. Flowers are typically pink-to-lavender purple or sometimes nearly white, the latter color often though will be found to be dried seed heads. In 1983 Stanley Welsh, Utah flora expert, renamed this taxon Cirsium undulatum variety tracyi. 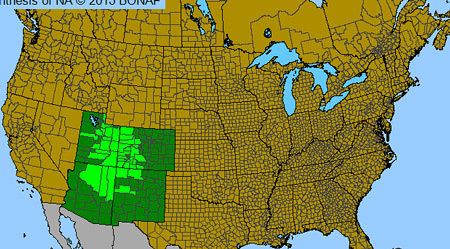 The USDA Plants Database follows this classification, but John Kartesz (ultimate authority for all names on this web site), Intermountain Flora, and the Flora of North America all keep these two taxa as separate species. 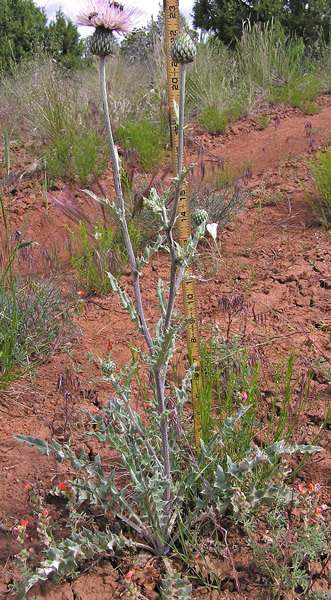 C. tracyi is found only in Utah, Colorado, and a very few counties of northwestern New Mexico. C. undulatum is much more widely spread through most western states, but Weber feels that it is rare on the Colorado Western Slope. 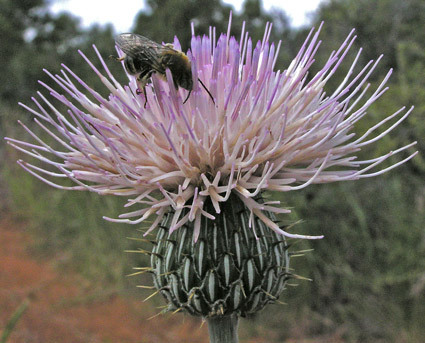 This plant was first collected for science by Charles Baker and Samuel Tracy near Mancos, Colorado in 1898 and was named Cardus tracyi by Per Axel Rydberg in 1905 and then renamed Cirsium tracyi by Franz Petrak in 1917. Canyons of the Ancients National Monument, June 12, 2005 & Boggy Draw Trails, June 17, 2011. Cirsium species can be broken into those with up to an inch high involucres (at left, the green and white portion below the head of pink flowers) and those with involucres 1-2 inches tall. C. tracyi has small involucres ; C. undulatum has tall involucres. However, as indicated at the top of this page, the FNA states: "Large-headed plants of Cirsium tracyi and small-headed individuals of C. undulatum are sometimes difficult to distinguish". John Kartesz indicates, "These two taxa are nearly impossible to separate consistently. You need root systems to make positive identification". Because roots are often missing from herbaria collections, specimens are often misidentified. 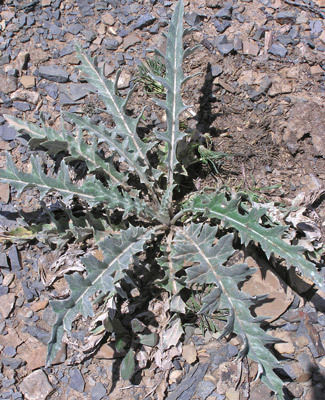 The wide spreading basal rosette of early leaves is typical of a number of plants and very typical of Thistles.